"Racism does not have a good track record. It's been tried out for a long time and you'd think by now we'd want to put an end to it, instead of putting it under new management"! None of us wants to be thought of as a bigot. Having a bias is expectable, since everyone has some kind of bias. For instance, it’s okay to have a bias against bigots, but that could mean that you’re really just a bigot. Or, it could mean that you have the good sense to know who to have a bias against, which isn’t bigotry at all, of course, but is actually a form of enlightenment. The difference between the two is more about knowing who and what to dislike. Recently bigotry reared its ugly head once again with the Trayvon Martin shooting, elevating America’s dark racial history in the media. All that was needed was a good story line and a couple of the right actors, with the right complexion in the necessary roles—add in a tragic shooting, and you have the makings of a hit. Before the gun powder had been wiped away the press had worked its magic. They had, like all good theologians, protected the sacred doctrines and found the heart of the matter—and with as little objectivity as could be mustered, they dutifully told the story. It was a sad tale of a young boy with a coke in one hand and a pack of skittles in the other—and a 230lb. racist Caucasian with a gun. As the story broke witnesses began to come forward. One of the first was a thirty something white woman who claimed to hear the sound of a child whimpering, begging for his life….and then…a gunshot. She spoke with a genuine anguish and made for a powerful witness, reinforcing the image of the twelve year old Trayvon, smiling innocently, that had become the public face that the press had selected to reinforce the emerging narrative. 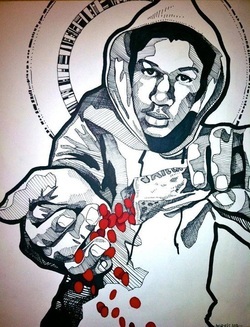 As the story continued to unfold it came out that Trayvon Martin was wearing a hoodie. Rappers, film makers like Spike Lee and professional athletes began to speak out against the obvious racism. Hoodies are “urban wear”, favored by blacks; clearly Zimmerman, the racist thug, saw the hoodie and interpreted it as a symbol of blackness. The young Trayvon’s fashion choice was apparently sufficient to act as a trigger, compelling him to stalk the young man, pull his gun, and then in an act of racist bravado probably shout some unmentionable slur like "Take that Buckwheat" and begin blasting. The media in a feeding frenzy over the stories potential to generate substantial market share began immediately to infer, from what little evidence there was, extravagant theories, rich in psychological detail and motive. The fact that hoodies aren't just “black-wear” didn’t matter. It was, and is, a powerful symbol of blackness—at least that was the initial theory. After all, what other motive could Zimmerman have? Maybe he saw the hoodie, and thought “Young and black, here’s my opportunity to take one of them out, a young one at that! He’s probably only going to end up in jail anyway; so I’ll be doing society a favor”! Maybe I’ll even get an award!” It had become a world of maybe’s and what if’s! Speculation was cheap, anybody could do it, find someone to identify with and write your own version of the events. With that in mind, the enlightened media, and the even more enlightened celebrities, openly wept as a sign of solidarity with the downtrodden. Clearly, they had forged a powerful bond with their gardeners, maids and chauffeurs—which in turn had sharpened their powers of empathy to a fine edge. In an effort to seek the justice that was being withheld by a racist criminal justice system, Spike Lee gave out what he believed to be George Zimmerman’s home address; after all, if the police weren’t interested in Justice, he was—probably with the hopes that the “New and Improved Black Panthers” might give him a good talking to. Not to be confused with the “Old Black Panthers” who had mostly killed one another as the result of turf wars and drug deals gone bad—or in the case of Eldridge Cleaver, who had sinned egregiously and become a republican. Unfortunately, Spike Lee’s leaked address was actually that of an elderly white couple, not Zimmerman’s. And so, after a series of death threats against the venerable pair, Lee was forced to go on national television and admit his mistake—and then buy them a new house—and pay for them to move—and who knows what else? It wasn’t enough! He assumed that he knew the facts, and with all of the insight that being famous, wealthy and black can provide, rushed to judgment. By giving out what he believed to be Zimmerman’s address he intentionally set in motion the very real possibility of vigilante justice. It was a lynch mob mentality worthy of the "Let's kill Emmett Till one more time award" for most shameless bigot of the year—a reboot of The Oxbow Incident. But Lee couldn’t be a racist, he wasn’t the right color. He only intended to right a terrible wrong, and by committing an equally terrible wrong he apparently hoped that justice would prevail. Maybe it was a case of “Two wrongs don’t make a right, but three do”! The press, seeing the logic of it all kept getting it wrong, hoping that maybe, if enough wrongs were done that they would inevitably lead to a right! At least it was worth a try. But the simple media narrative was getting overly complex. What to do about those sloppy, ill-fitting plot threads. Maybe it was more like an O. Henry short story with an unexpected twist. That could make things interesting, just as long as story ended appropriately. And so, the media worked hard to make right their previous wrongs, taking the existing evidence and rewriting it, just in case the public got confused and forgot what to think. More information began to slowly come to light. 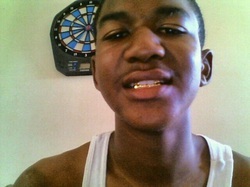 Trayvon Martin was no child. He was seventeen and 6’3”, or maybe 6’2”, possibly 5’11”, take your pick. He was a slim, athletic, high school football player, 155 to 160 lbs. with a mouthful of gold teeth, who had been suspended from school for not doing his homework—or carrying a screw driver and having a bad attitude, depending on who you asked. He had recently gone to live with his father to get away from the negative influences in his old neighborhood. His new neighborhood was racially mixed. It wasn’t an isolated lilly-white, suburban haven for whites looking to escape “urban ruffians,” although it would have helped the story line if it had been. Likewise, George Zimmerman wasn’t 230 muscular lbs., but was 5’7” and 175 flaccid lbs. The image that had been selected by the press of a heavier, chunky-faced Hispanic male, only served to muddy the water further. Was he white, Jewish, Hispanic?—his name sounded Jewish, which he is on his father’s side, but his mother is Hispanic, meaning that George Zimmerman, like Trayvon Martin, is a minority. This confused the media and the public alike. If he wasn’t white, what was he? Was he a Jew? That would mean that he was white….right? If he was Hispanic, was he a white-Hispanic—everybody knows that a little bit of white is all that it takes. 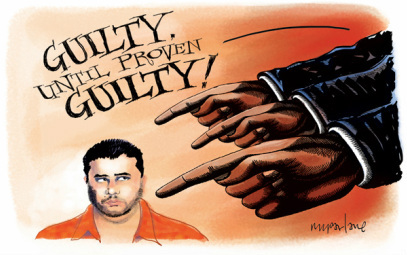 The implication being that, as long as some white was present, he had to be guilty! Maybe it would be necessary to judge him according to blood quantum, like Native Americans do when attempting to determine the degree of native blood. This, in turn, determines who gets to be a member of the tribe. Gambling, and the sale of cheap, non-taxable cigarettes, give Native Americans substantial profits, which, in turn, can enable tribe members to live without having to worry about work. There are government subsidies as well. All told, it can be profitable to be a tribe member. This is one of the many difficulties in parsing racial affiliation in order to establish who benefits and who doesn't It is far more problematic, however, when applied to the law. Justice is supposed to be blind, not standing ready with a syringe and a color chart, ready to pass judgment based on group affiliation. The fact that past racial injustices were, and sometimes still are, a problem doesn't mean that new racial injustices would somehow equate to fairness. But, in a world where most of the public and the media have a limited conception of how their legal system actually works, anything can sound reasonable. Then it became a referendum on guns. What was he carrying a gun for? It could only mean one thing; that he was for gun rights, which probably meant that he was a Republican. And if you’re a Republican you have to be white. What other proof was needed? Personal intuitions, racial solidarity, the correct political affiliations, all of these were factored, all the while ignoring the actual evidence when passing judgment. Other witness’s came forward, some said that George Zimmerman was a bully who threatened them, and then demanded their lunch money. They, however, wished to remain anonymous, which meant that they couldn’t act as a witness for the prosecution, since an anonymous witness can’t be subjected to cross-examination. Stories about Trayvon carrying around a flat-head screwdriver and a bag of women’s silver and diamond jewelry were also confusing; maybe he was just a budding teenage lapidary specialist who did side jobs as a handyman. The principal of his school thought otherwise. When Trayvon was asked where the jewelry came from, he said a friend had given it to him to hold, but, when pressed for a name, none was forthcoming. He was also suspended from school for having a bag with traces of marijuana—and he had traces of marijuana in his system the night of his death, which only served to further complicate an already complicated case. Increasingly, it became a case of he said, she said, black vs. white, left vs. right—anything but a patient, objective, search for the truth. In the marketplace of ideas, he who gets to the market first with the most compelling story gets the biggest chunk of advertising dollars—and a few precious minutes of airtime. Credibility was also a factor. Without credible witnesses it became a case of hearsay. “I know someone, who knows someone…..and they said...” doesn’t work in a court of law. But, for the press and a racially polarized public, it was enough. Public debates raged over the fine points of the new “Stand your ground” law—with advocates on both sides arguing like high-priced tax attorneys searching for that invisible loophole in the law—hoping to thread the camel through the eye of the needle, all the while swatting furiously at the gnats swarming in either direction. Petitions were signed in an effort to force the hand of justice by those who believed that the death of Trayvon Martin was a clear cut case of murder. They had obviously arrived at that conclusion by some process involving omniscience, since there was very little objective evidence forthcoming at that point. Justice isn’t a popularity contest. A jury must find a defendant guilty based on all of the available evidence, and it must be unanimous, not following a party line. Reasonable doubt in the minds of some appears to mean that you should select evidence like dining at your local “all you can eat” restaurant—I’ll take a little of this, a bit of that. Likewise, a teenager with an attitude problem and a little bit of weed in his system tells us nothing about whether George Zimmerman was justified in shooting Trayvon Martin. If bad attitudes and pot smoking were a reasonable basis for homicide, most of us would have never made it out of our teens. There may never be a clear resolution to this story. There are simply too many voices with too many agendas. The truth, in the end, may be like the tree that falls in the forest, making no sound, presumably because no one was there to hear it, at least, no one of significance. Such a metaphor can either be construed as an epic conceit, or, as a belief that the truth, whatever it may be, rests upon the personal intuition of an anointed few who need no facts, their deeply held beliefs are enough. None of this diminishes the tragedy of what happened. Nor does it help to clarify the guilt or innocence of either of the individuals involved. A young man is dead at the age of seventeen. Another is on trial for the crime—with the families of both left trying to understand what really happened and why. Maybe there is no why, only events set in motion by something as intangible as circumstance. In the end, it will come down to a jury of twelve good men and woman who will determine the truth, at least, the official version. And so, America’s dark history of racial animus is once again front and center, played out on the global stage for all to observe—with the deeply held convictions of a fractured audience taking shape like a bad dream. A dream that can be played and replayed in an endless loop of accusations and acrimony, where individual beliefs will amend the facts until the story is as it should be. Racism is not dead, but is alive and well—a bad thing for some, a better thing for others. There are, and always have been, beneficiaries of racism. From the slave holders and slave traders of old, to the profiteers of a voracious media, to a few prominent civil rights activists who keep it alive as a cudgel to aid in a perverse kind of racial advancement. Race may have been the motivating factor in the minds of Trayvon or George, but, at this point, that would just be a guess. It requires no speculation, however, to see the truth of it in the endless conversations around the water cooler or in the social media. Average folk everywhere, rich and poor alike, black, white and other, have used the crime as a mirror reflecting their innermost thoughts—suggesting that the real problem might be a good deal worse than anyone had previously imagined.